Assuming you’ve installed WP Simple Pay and activated your license, you’ll now need to set your Stripe API keys. If you haven’t already, you’ll also need to sign up for a free account at Stripe.com. In your WordPress admin, go to Simple Pay → Settings → Stripe Setup. Click the “Connect with Stripe” button to connect WP Simple Pay to your Stripe account. You’ll be taken to Stripe.com where you’ll be prompted to either create a new Stripe account or log in to your existing one. Once you complete this process, you’ll be taken back to your website’s Stripe Setup tab. On the same tab is the Test mode toggle. We highly recommend staying in Test mode until you’ve completed setting up your payment forms. Read more about using Test mode. Now it’s time to create your first payment form. Read more about Stripe Connect. Previous versions of WP Simple Pay required you to set your Stripe API keys manually. This is also available via a link within the settings in the current version of WP Simple Pay Pro only. Login to your Stripe dashboard and select Developers from the menu. Note: If you see an “Upgrade Available” button here, we recommend that you go ahead and perform the upgrade to keep your active Stripe API version current. Next, select API Keys from the menu (under “Developers”). 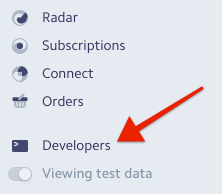 In addition, make sure View Test Data is toggled on so you’re in Test mode. See Using Test Mode for more details. Now open up a new browser tab and log in to your WordPress admin. Then go to Simple Pay Pro → Settings → Stripe Setup. At this point, you’re going to need to copy and paste 4 Stripe API keys from your Stripe dashboard to your WP Simple Pay Pro settings. Back in your Stripe dashboard tab, start by copying your Publishable key (starts with “pk_test_”), switching to your WP admin tab, and pasting it into the appropriate text box. Now do the same for the Secret key (starts with “sk_test_”). Back in your Stripe dashboard tab, switch to Live mode (toggle “View Test Data” off), and repeat the above for your live keys. In the end, it should look something like this in your WP Simple Pay Pro settings. When done, click Save Changes. If you need to disconnect from Stripe for whatever reason ( to connect to a different Stripe account perhaps ), in your WordPress admin go to Simple Pay Pro → Settings → Stripe Setup. 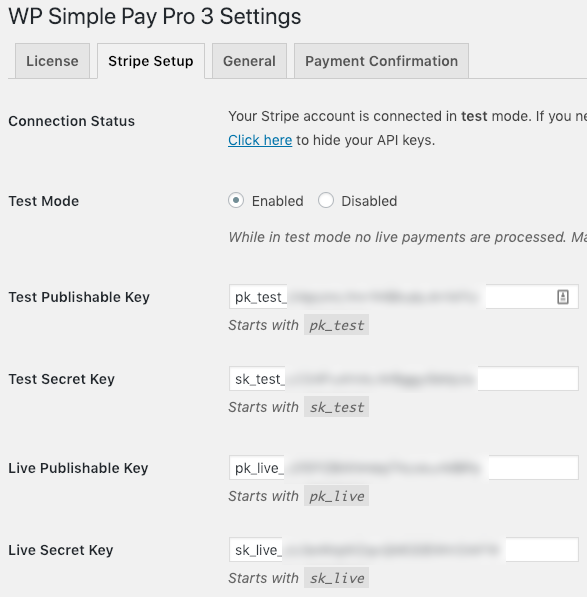 You’ll need to highlight and delete all 4 Stripe API keys from your WP Simple Pay Pro settings. Once you have done that, click the Save Changes button. You should once again see the Connect with Stripe button and are free to connect to another Stripe Account.